Ravening beasts still human but uncontrollable! 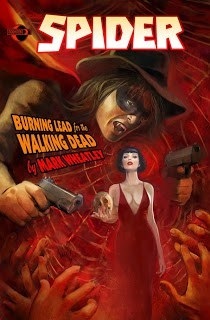 A Spider adventure very much in the vein of the original Pulp Magazine! I discovered this book when perusing the Moonstone website. It took me a while to locate a copy, but I am very much glad that I did! The stark black and white artwork lends noir to the story, a perfect fit! The art sets off brilliantly the epic story contained in the script! It should be a “must read” for every fan of the Violent Knight, the Master of Men, Richard Wentworth, the sinister Spider! A new restaurant, The Culinary Club, has opened in Manhattan. The proprietor Rosa Sleen, seems to have a history with Wentworth which is not detailed in this story. Flanked by two Siberian tigers, she welcomes Wentworth, Nita Van Sloan, and Commissioner Stanley Kirkpatrick to her tables. The Spider suspects a much more sinister side to Rosa and the Culinary Club. Exactly what are the clientele at the restaurant having for dinner? Trapped by raging zombies, will the Spider survive? You’ll have to read the adventure for yourself! It is a sinister story of risk and the risqué! I give this little gem five stars! I usually give a link to where you can buy this, but you may have to check used bookstores. This is the link to Moonstone.